Widespread flooding in Jasper County in northwest Indiana continued Saturday morning after a Kankakee River levee broke near Hebron. JASPER COUNTY, Ind. (WLS) -- Widespread flooding in Jasper County in northwest Indiana continued Saturday morning after a Kankakee River levee broke near Hebron. That breach left many homes surrounded by floodwaters. Dozens of families have left their homes and it could be days before they return. The water continues to threaten homes and rescue boats were on standby. Authorities are urging residents to evacuate, as those who stay may be putting their lives and rescue workers in danger. 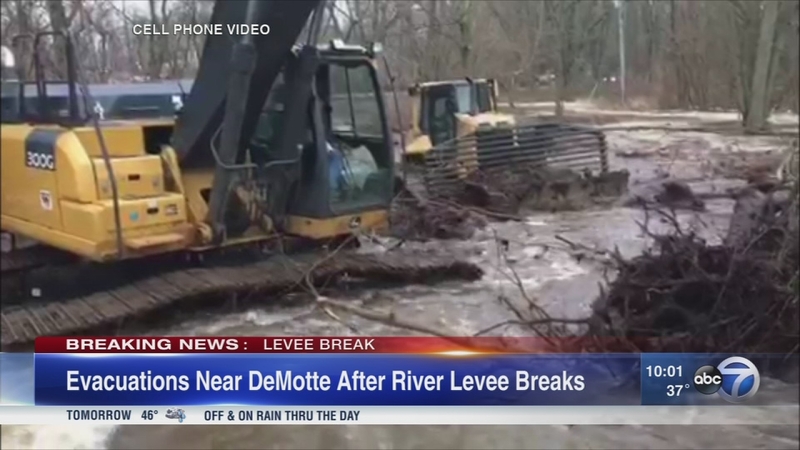 The levee, roughly at N 700 W and the Kankakee River, broke on Friday as the river reached record levels. A Kankakee River levee has breached near Hebron, Ind., officials said. "It's quite a mess," Jasper County Sheriff's Department Special Deputy Andrew Boersma. "It seems like the river has rose from the six inches of snow then there have been six inches of rain." Neighbors in Jasper County have been helping each other put sandbags around their homes. "My buddy over there, I think his home is just about getting flooded right now. There are other ones that are flooded," said resident Terry Vance. Emergency officials are asking homeowners to head to drier ground. They have shelters on standby. NIPSCO crews have shut off gas service for dozens of customers in the area. "We asked the people to evacuate voluntarily. Some have and some haven't. That's their choice," said Jasper County Emergency Management Director Karen Wilson. "I told my one neighbor to come over and stay at my house until the water goes down," said Vance. This growing pile of debris building up against this bridge isn't helping. "Right now we have a significant log jam on the river. Locally we have exhausted resources for that. The district resources as well are being taxed," said Wilson. And they fear relief from the flooding could be days away. "We are still in a situation where it is going to continue to probably get worse before it gets better," said Wilson. The river is expected to crest later in the week, so emergency responders are encouraging families to find temporary homes. "Get out. That's my message. Get out. You're in there. You're not going to save your home at this point. And all you're doing is endangering the lives of the first responders," said Chief Randy Woods, Keener Township Fire Department. No water rescues were conducted late Friday or Saturday morning, but authorities continue to monitor water levels, said Tyler Brock, a conservation officer with the Indiana Department of Natural Resources. First responders prepared for boat rescues in the Ramsey's Road subdivision near DeMotte, where about 30 to 40 homes are in the path of the rising waters. Sandbags and heavy equipment were brought in, but the breach only got bigger and grew to at least 30 feet wide.